The chief minister of the south Indian state of Telangana has caused outrage after moving into a palatial new home that cost taxpayers $7.3m (£5.8m). The building is spread over 9,000 square metres (100,000 sq ft) of prime real estate in Hyderabad city. 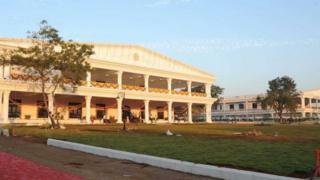 It has bulletproof bathrooms, an auditorium which seats 250 people and a meeting hall that accommodates 500. The house was blessed by the minister's special guru while the bulletproof bathroom has been roundly mocked. Chief Minister K Chandrashekhar Rao moved into the house on Thursday after a series of religious rituals led by his spiritual guru, Chinna Jeeyar Swamy. Mr Swamy also sat in Mr Rao's official chair to "bless" it. The house, named Pragathi Bhavan, was built in close consultation with vaastu (similar to Feng shui) experts. Mr Rao is a great believer in vaastu, which is an ancient Hindu custom used in construction. He has also been in the news for trying to demolish the state's secretariat complex because he believes its vaastu is bad for the state. Senior political commentator and author, Kingsuk Nag, told BBC Hindi's Imran Qureshi that the house exposed Mr Rao's "feudal" mentality. "It's like the good old days when the feudal lord would have a castle that would have a house as well as his office. And, then the subjects would say, oh, what a big palace," he said. Using security concerns as justification for the scale of the residence, made no sense, he added. Mr Rao's move came only weeks after the lavish wedding of the daughter of another Indian politician also fuelled anger among cash strapped Indians.